The first large scale building projects seen in Ancient Egypt occurred during the reign of Pharaoh Khasekhemwy whose rule extended until 2686 BC. Khasekhemwy is known for a large mud brick structure at Hierakonpolis, a larger one at Abydos (also mud brick) and the Gisr el Mudir at Saqqara, which has a huge wall of roughly dressed stone. Little is known about the next two rulers, Sanakhte and Nebka, even their existence as Pharaohs is uncertain. No major building projects are attributed to them. With Pharaoh Djoser (Zoser) the Pyramid age began. Djoser ruled from 2668 to 2649 BC. During that time the high priest of Heliopolis was a man named Imhotep. Perhaps Imhotep gained access to secret writings from an earlier, now unknown, civilization. What is sure is that he introduced the Egyptians to building with dressed (squared) stone and many other innovations. Stone had only been used in small special locations previously. The only structure known for certain to be built by Imhotep is Djoser's Step Pyramid at Saqqara. Perhaps Imhotep also designed the unfinished Pyramid complex of Sekhemkhet, the intricate stonework of the walls certainly shows his influence. The Djoser complex includes a number of buildings, a beautifully finished enclosure wall, and the Pyramid: 121 X 109 meters (397 X 358 feet), with a height of 60 meters (197 feet) - all covered with dressed stone. Imhotep was later revered as the greatest architect, physician, scientist and wizard in Egyptian history. The Edwin Smith Papyrus is an Egyptian medical text attributed to Imhotep. The text provides a highly practical perspective on injuries, much like our modern understanding. The tomb of Imhotep has not been found. It likely is located not far from Djoser's at Saqqara. This tomb may hold many answers regarding the origins of Egyptian science. Here we have to pause. We are asked by archaeology to believe that in two decades Egyptian architecture shifted from piles of mud brick to the astounding achievement, both in size and concept, that is the Step Pyramid Complex. Bronze tools, which appeared about this time, made stone working more efficient, but nowhere else in the bronze age world did men build on anything like the scale of Egypt, by an order of magnitude. Archaeologists rarely consider the source of Imhotep's innovations. It could be argued, without much hyperbole, that modern civilization stems from what he revealed. Archaeologists believe the Step Pyramid was derived from the mastaba, a raised, long thin mud brick tomb. The conventional theory is that a pyramid is simply stacked mastabas. It could also be that the Egyptians adapted the Sumerian Ziggurat, a style that was popular in cities not very far away. 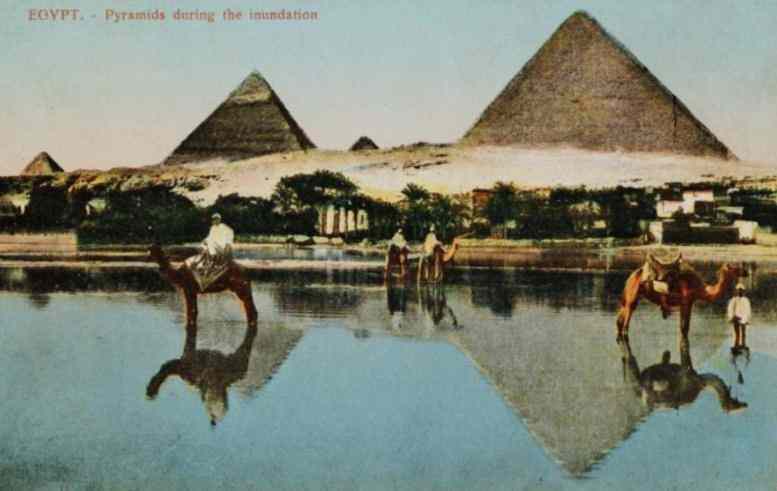 Two tourist postcards, dated 1900. After Djoser, the next 36 years saw a couple unfinished, smaller stone pyramids and a large brick one. Sneferu became Pharaoh in 2613 BC. At about the same time engineering suddenly advanced again. Sneferu built three huge Pyramids, all of dressed stone. Perhaps each shows an improved design as archeologists believe, although other explanations are possible. And then, in 2589 BC, Cheops (Khufu) began his rule and, soon after, his pyramid, a structure now known worldwide as the "Great" Pyramid. From Djoser to Cheops - 2668 until 2589 BC - was 79 years. More or less, Old Kingdom dating is not accurate. In this short period there was the development of a technology that created a Pyramid that in size, alignment and precision outshines any other structure yet built by humans. And then came decline. Subsequent fourth dynasty pyramids were a little smaller, a little less accurate. Soon the technology that appeared so suddenly was available no longer. Later dynasties built smaller pyramids with a stone outer casing filled with sand and loose stones. A facade of a pyramid is much easier to construct, and much more vulnerable to time. These pyramids today are little more than shapeless mounds. The last known Egyptian royal Pyramid was built around 1750 BC, in the 13th Dynasty. The people of Egypt in the Fourth Dynasty cut, moved, raised, placed and squared twenty million tons of stone to build their pyramids and associated temples, plazas and causeways. Today we would need a half million full size diesel trucks to move all that stone. The mind reels from such numbers. Lined up, those trucks would reach half-way around the world. And they did all this with only copper or bronze tools, tools in many cases softer than the stone they carved. Except for a few meteorites there was no iron. The wheel and draft animals didn't exist yet, they had ropes, levers, sledges and human labor. It would be impossible to find, in any time or place in human history, another such sustained effort by such a large portion of the populace. Before modern time, two other projects approach the pyramids in scope: the Roman road and aqueduct system and the Great Wall of China. But the comparison fails, the population was hundreds of times larger, the time to build was much greater, and nowhere is accuracy similar to the pyramids. There is another difference. As well as we can understand that far off time, the workers who built the pyramids were free citizens. Chinese history records perhaps a million laborers killed in building the Great Wall. The Romans also had little concern for the safety of their workers. Zahi Hawass has explored the cemetery of the pyramid workers ... he found ten who appeared to have been crushed and killed. Only ten, at least found so far. The pyramids are amazing on so many levels. Were the Pyramids tombs? Many who reject mainstream archeology's explanations have advanced various theories, but it seems likely that they were. 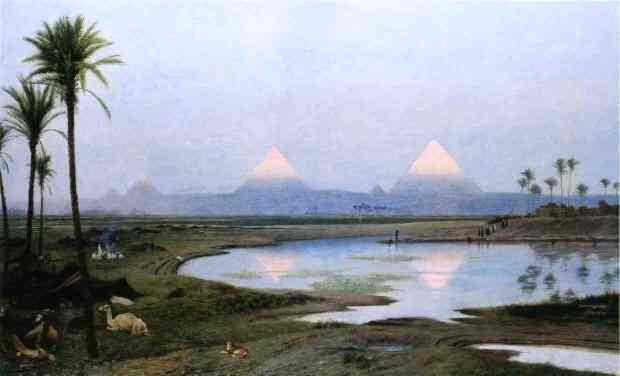 The Gisa plateau is a huge graveyard, the Great Pyramid is surrounded with hundreds of burials from the time of Cheops. 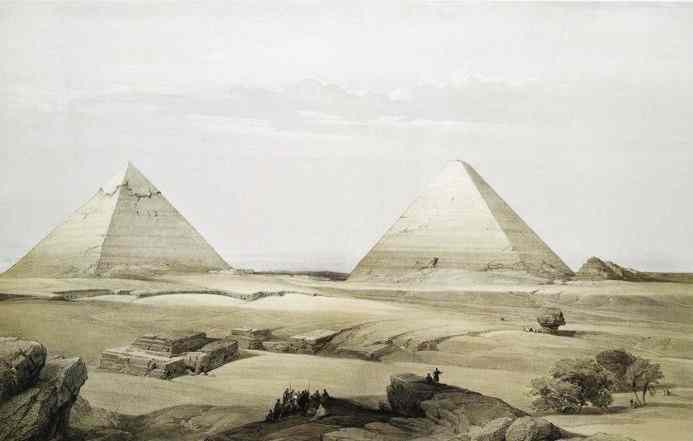 Coffers were found in all three principal Giza Pyramids that certainly resemble those used in burial. And significantly, if the Pyramids are not tombs then where were the fourth dynasty Pharaohs buried? No other structures of Pharaoic proportions have been found from this time. In 2013 a trove of papyrus documents dating to the 27th year of Cheops' reign was discovered at the former Red Sea port of Wadi-al-Jarf. These are the oldest paper records yet found anywhere. Included were about two months of the log book of the foreman (named Merer) of a crew of about 200 men. For part of the year, during the Nile flood, they were engaged in transporting limestone blocks from Tura by boat for Cheops' pyramid. Zahi Hawass has found the base of the construction ramp for the Great Pyramid. It is located to the south, was made with stone and mud walls and used gypsum as a lubricant. Yes they were tombs, but they were more as well. The Pharaoh was the intermediary between the spiritual world and the physical, bringing fertility, and abundance to Egypt. His tomb, and the continuing service of the priests who daily offered ritual for him, were intended to perpetuate this flow of life force to the land. Perhaps that goal would be sufficient to motivate the population for the vast building projects that were the Pyramids. And so they remain, as they have throughout recorded history, enigmas in dressed stone, much too large to ignore, much too precise to dismiss. And yet we somehow have convinced ourselves that they are curious relics, interesting, but of no real importance. We overlook the inconsistency, the riddle of the greatest being the earliest. We have a past far more interesting than we now believe it to be. Here the reader has an option. The remainder of this page, after a chart of the principal Egyptian Pyramids, covers some of the truly extraordinary mathematical facts about the Great Pyramid and Egyptian science. For those to whom the beauty and spiritual power of Ancient Egypt are more interesting we have another large website full of stories and pictures of the range of Egyptian history. AscendingPassage.com features a library of first hand accounts of 40 different ancient temples and tombs covering the length of the Nile. 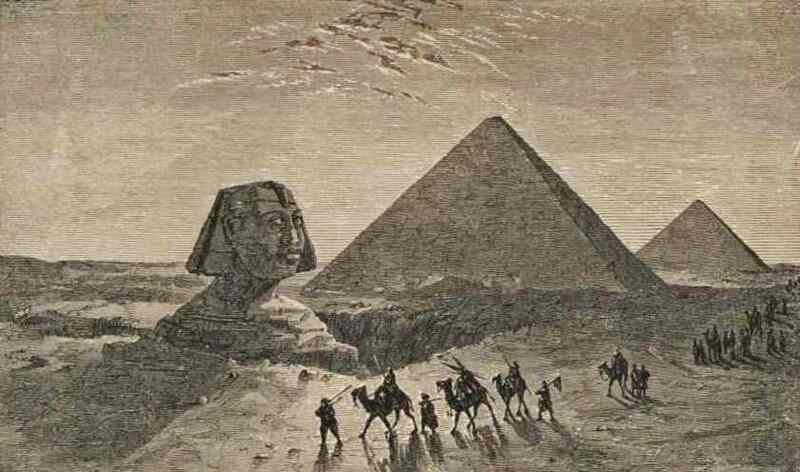 There are ideas that challenge and expand upon conventional Egyptology and a vast collection of 19th century engravings, like the ones on this site, that evoke the magic of Ancient Egypt more fully than modern photographs. Last Pharaoh of Second Dynasty. Beginnings of Bronze age in Egypt. (Netjerikhet) Commissioned the Step Pyramid at Saqqara designed by Imhotep, considered the first Pyramid. (Djoser Tati) Unfinished pyramid at Saqqara. Khaba Probable owner of step Pyramid at Zawyet el-Aryan. Huni Some believe he began the Pyramid at Meidum. Angle: 51 degrees, 50 minutes 35 seconds. Angle (upper): 43 degrees, 01 min 30 sec. The "Great Pyramid" at Giza. Angle: 51 degrees, 30 minutes 35 seconds. One subsidiary and three "Queens'" Pyramids. only about ten meters remains. Angle: 53 degrees, 7 minutes, 48 seconds. First course of casing is granite. Bikheris uncertain, listed by Manetho. May have an unfinished pyramid at Zawyet el-Aryan. Pyramid size: 200 meters (656 feet) square. time of rule is uncertain. Angle: 51 degrees, 20 minutes, 25 seconds. in particular the dates of rule of the kings. Pyramid information - "Cultural Atlas of Ancient Egypt"
A full list of Egypt's pharaohs is at: Pharaoh (King) List. Causeway to the Great Pyramid. by W M Flinders Petrie, 1891. Perhaps the most interesting part of the subject was tracing how the work was done. The great barracks of the workmen were found behind the Second Pyramid, capable of housing four thousand men; and such was probably the size of the trained staff of skilled masons employed on the pyramid building. Besides these a large body of laborers were needed to move the stones. This was done during the inundation, when water carriage is easier, and the people have no work. Herodotus gives the echo of this, when he says that the relays of laborers only worked for three months at a time. Tools are needed as well as labor, and the question of what tools were used is now settled by evidence, to which modern engineers cordially agree. I found repeatedly that the hard stones, basalt, granite, and diorite, were sawn, and that the saw was not a blade, or wire, used with a hard powder, but was set with fixed cutting points, in fact a jeweled saw. These saws must have been as much as nine feet in length, as the cuts run lengthwise on the sarcophagi. One of the most usual tools was the tubular drill, and this was also set with fixed cutting points. I have a core from inside a drill hole, broken away in the working, which shows the spiral grooves produced by the cutting points as they sunk down into the material. This is of red granite, and there has been no flinching or jumping of the tool. Every crystal, quartz or felspar, has been cut through in the most equable way, with a clean irresistible cut. Modern drill cores cannot hold a candle to the Egyptians. By the side of the ancient work, modern cores look wretchedly scraped out and irregular. That such hard cutting points were known and used is proved by clean cut fine hieroglyphs on diorite, engraved without a trace of scraping, and by the lathe work, of which I found pieces of turned bowls with the tool lines on them, and positive proof that the surface had not been ground out. The lathe tools were fixed as in modern times, to sweep regular arcs from a center, and the work is fearless and powerful, as in a flat diorite table with foot, turned in one piece. They can be also surpassingly delicate, as in a bowl of diorite, which around the body is only as thick as stout card. 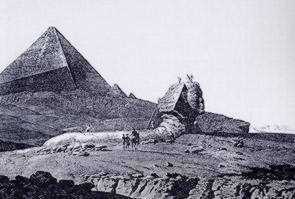 The great granite sarcophagi were sawn outside, and hollowed by cutting rows of tube drill holes, as may be seen in the Great Pyramid. No doubt much hammer - dressing was also used, as in all periods, but the fine work shows the marks of just such tools as we have only now re-invented. by William Mathew Flinders Petrie, 1891. 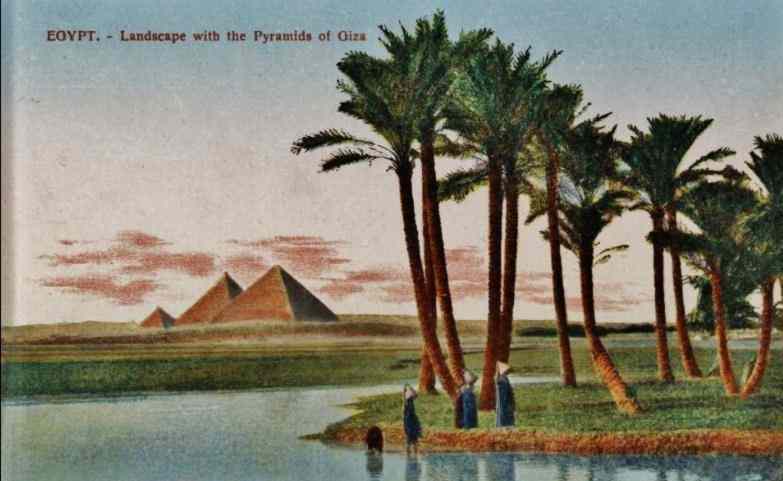 The Great Pyramid occupies a land area of 13 acres (5.3 hectare). The builders used about 2.3 million stone blocks, most are limestone from quarries in the Mokattam hills across the Nile. Giant caverns can be seen there where the builders dug deeply into the mountains to get only the best stone. The blocks weigh on the average about 2 1/2 tons each (2200 kilograms), they are placed in 203 courses. The courses are of differing heights, generally getting smaller towards the top. An exception is the 35th course which is built of larger stones. Granite blocks of 70 tons each (64,000 kilograms) were brought 500 miles (800 kilometers) down the Nile from Aswan for the King's Chamber. Fine white limestone casing stones, now missing, 5 feet (1 1/2 meter) high, 12 feet (3 1/3 meters) long and 8 feet (2.4 meters) wide, some weighing 15 tons (13,000 kilograms), were fitted to enclose the entire structure, a surface area of about 22 acres (8.9 hectare). The sides of the casing stones where they abut their neighbors are filled with a mortar, the composition of which is still uncertain. These sides are so straight and square that the gap between them is 1/50 of an inch (.01 cm). The mean variation of the surface of the casing stones from perfectly flat is 1/100 inch over 75 inches (.004 cm over almost 2 meters) as determined by W.F. Petrie from the few examples found at its' base. It is unknown but probable that this precision was continued through-out the 22 acres of Pyramid surface. The Great Pyramid's foundation of fine limestone blocks is within 7/8 inch (2 cm) of true level, and even that small inaccuracy could be the result of subsidence of a portion of the plateau due to the weight of the Pyramid or earthquakes. 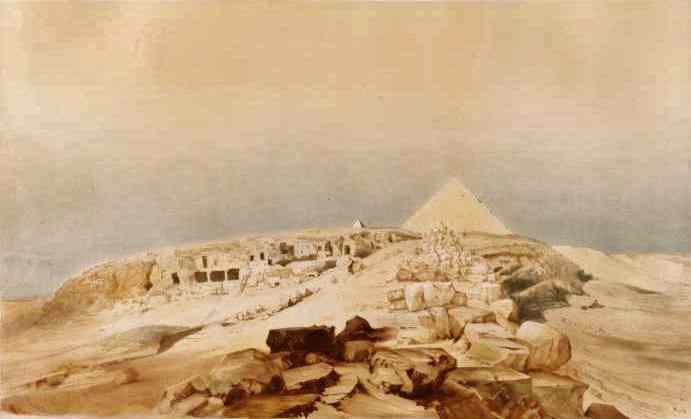 There is a slight hollowing of all four sides of the Great Pyramid, which escaped notice until Petrie found it in his survey of 1881. The indentation is at its greatest on the northern side where the center of the face is set back 37 inches (94 cm). This perhaps was to make the monument stronger, to improve its' appearance, or perhaps some more esoteric reason. One certainty - if the hollowing was carried to the casing stones the difficulty of maintaining the extreme precision with which they were faced increases still further. Archaeology estimates that the entire population of Memphis at the time was on the order of 50,000 people. Beyond them, the majority of the people were farmers, fewer of them than in later centuries. It is difficult to understand how this small labor force, without iron tools, built the pyramids with any of the methods conventional archaeology accepts. Many relationships between the Great Pyramid and various factors have been theorized. Some may be intentional, others may be coincidence. Even pared down to the few correlations specified by ancient authors and verified by modern measurement, it is clear that the Great Pyramid represents a unique geometric figure attainable only by a highly evolved mathematics. The height to perimeter ratio is pi ( "π" ) (Smyth: 3.14159+) (Petrie: 3.1428+). This relationship is basic to this particular Pyramid form and no other. It establishes a direct relationship between the Pyramid and a half sphere - and thus with the Northern Hemisphere of our planet. The faces of all pyramids are aligned to North, East, South and West. The alignment of the Great Pyramid deviates from true on two corners by three minutes, on one by thirty seconds and the fourth by only two seconds. While this accuracy would be stunning today, it may be largely accounted for by movement of the poles. As it stands the Great Pyramid is extraordinarily precise in its alignment. Agatharchides of Cnidus was a guardian and philosopher in the court of the king of Egypt at the end of the second century BC. From sources available to him he reported that the base of the Great Pyramid was 1/8 minute of latitude. This has been proven correct by modern measurement to within a tenth of a percent. The coordinates of the Great Pyramid are: 29°58.45.N by 31°08.03.E. This puts the Pyramid only about 2 km south from the 30th degree N latitude. Given the close accuracy of the monument in building and orientation, this must be intentional. Science claims Eratosthenes of Cyrene invented the coordinate system in the 3rd century BC. He was not aware that the Egyptians preceded him by 2000 years. "The Innocents Abroad" by Mark Twain, 1869. The Great Pyramid does not stand in historical isolation. While the Great Pyramid is the largest, and by most accounts the most accurate, there has been little interest in the geometry and accuracy of the other Fourth Dynasty pyramids. Fifth Dynasty and later pyramids are more poorly built, less well preserved, making exact measurment difficult. It is likely that all the pyramids of this era contain mathematical principles and intentional relationships, perhaps including some important ideas that modern science is currently unaware of. Egyptian temples were reflections of the gods that they served, using sacred geometry to evoke specific energies. Perhaps eventual research will find very specific explanations for the positions, size and angles of the other pyramids. Much of the information on this page comes from "Secrets of the Great Pyramid" by Peter Tompkins, appendix by Livio Catullo Stecchini. 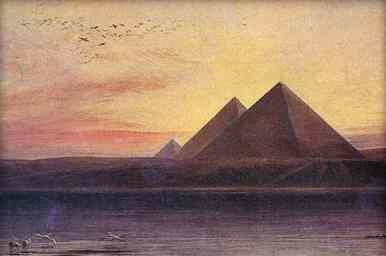 The Ancients knew Egypt as the very source of Mystery. covering the length of Ancient Egypt and a bit beyond.